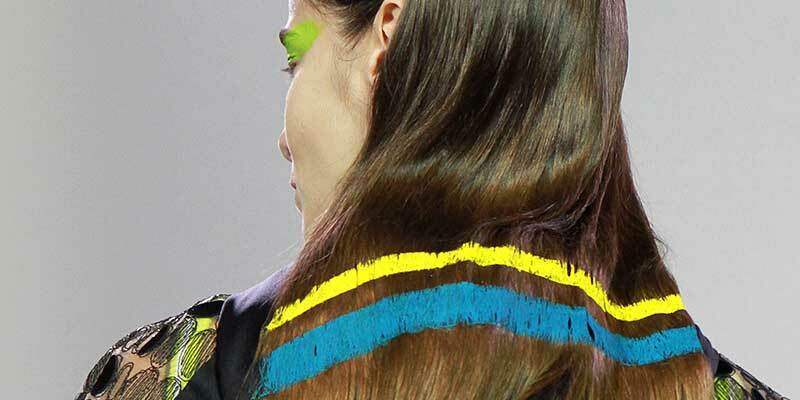 Backstage at the Byblos SS 2018 Fashion Show Adrian Clark (hair stylist) hand painted the models’ hair with bright graphic stripes. Watch the video interview and the images if you want to know more about this very interesting and original hair look! The whole concept was inspired by martial arts movies. We wanted to make the girl really feminine but at the same time we wanted to use the disciplines of martial arts and karate. So we looked a lot of those films with strong female women like Uma Thurman in ‘Kill Bill’. We kind of looked to all those sorts of films and we wanted to reflect that mood in the collection. A lot of the prints in the collection are very strong graphic clean-lined colors and this is what we also wanted to reflect in the hair style. So it mirrors the fabric in a lot of ways because it’s all about a clean graphic line. But that line isn’t perfect. It’s soft, it breaks. We wanted to make it feminine at the same time, because the Byblos woman is always feminine and beautiful. So we kind of wanted to reflect that in the hair and in the makeup as well. We used masking tape which is usually used for cars and spray-painting graffiti and we used it in a very similar way. It’s a bit sort of like an art school project. We masked the hair off and then we mixed hair gel with really strong colored pigments [pigments in powder like the ones the make-up artists use – make sure they do wash out!] and then we painted the stripes on and we dry them and then we take the masking tape off and then it’s done. 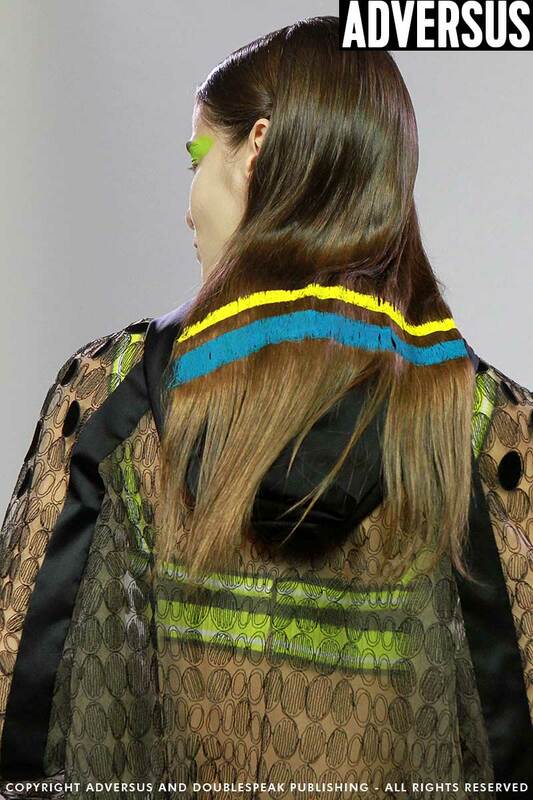 When the girls walk down the runway, it’s very important for the hair to stay still, so we braided the hair underneath to reduce the volume and also so that the hair doesn’t move. 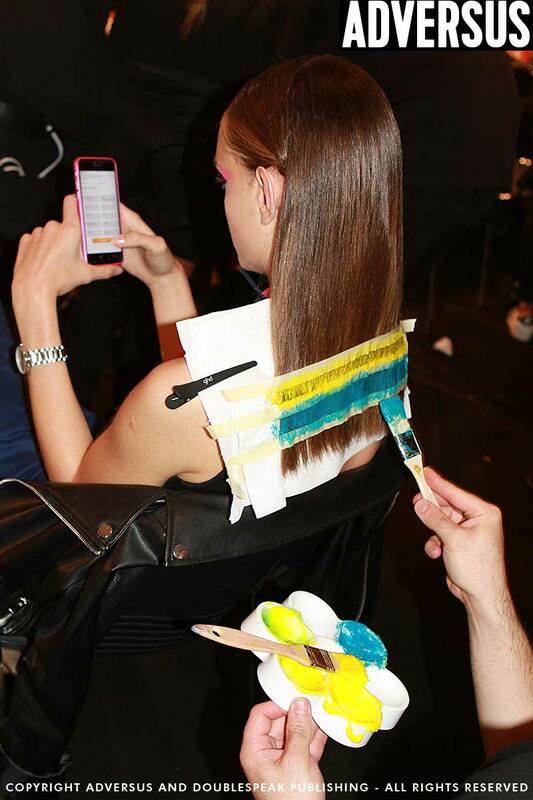 So that’s just like a sort of secret preparation that we do to the hair that you don’t actually see.